Michael Joseph Jackson was born on August 29, 1958 , and died on June 25, 2009. He was an American musician, dancer, and entertainer. Referred to as the King of Pop, he is the most commercially successful and one of the most influential entertainers of all time. His unique contributions to music, dance, and fashion,along with a highly publicized personal life, made him a prominent figure in popular culture for over four decades. Alongside his brothers, he made his debut in 1964 as lead singer and youngest member of The Jackson 5, and later began a successful solo career in 1971. Jackson's personal relationships and life generated controversy for years. 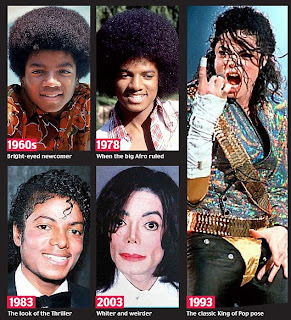 His changing appearance was noticed from the late 1970s onwards, with changes to his nose and to the color of his skin drawing media publicity. He was accused of child sexual abuse in 1993 though no charges were brought, and in 2005 he was tried and acquitted of further allegations. He married twice, first in 1994 and again in 1996, and brought up three children, one born to a surrogate mother. While preparing for the This Is It concert tour in 2009, Jackson died at the age of 50 after suffering from cardiac arrest. He reportedly had been administered drugs such as propofol and lorazepam, and his death was ruled a homicide by the Los Angeles County coroner. His death triggered an outpouring of grief from around the world with his globally live broadcast memorial service attracting an audience of up to one billion people. Posted by Gaby Cordova at 6:17 p.m.